Hidden in the bylanes of the colourful Tibetian colony, Majnu Ka Tila is ‘Coffee House’. It is 15-20 minutes away from the students’ hub-North Campus. Tucked away from the rest of the market, it is a cozy little underground café frequently thronged by students and adults alike. One can also spot monks coming here for a quiet cup of tea or coffee. Since its not very far from the north campus of Delhi University, 90% of the crowd will be students coming in to have a cup of coffee or a muffin before they head back to be grilled in their lectures at college. The moment you enter the place, the aroma of fresh cakes will grip you to the place till you try atleast one o them. 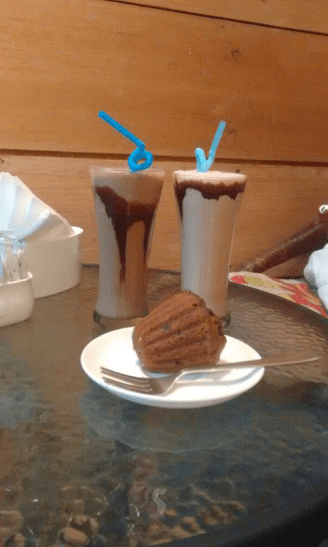 They have a simple menu consisting of different variants of teas, coffees, mocktails and scrumptious cakes to choose from. Their cakes and muffins are freshly baked and served hot. Their Mud Cake is the most frequently ordered dish. 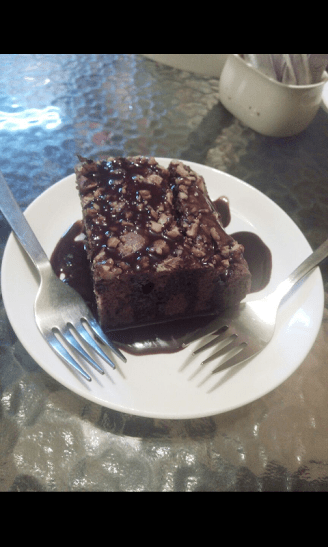 It is a soft and spongy chocolate cake served with a generous topping of chocolate syrup. Also, the rates are very pocket friendly. Their generous helping of marble cake is best when combined with Iced Mocha. They also serve delicious choco chip muffins and choco walnut brownies. Summers become more tolerable with a glass of green apple mojito or lemonade. The place also caters to conventional tastes by offering fresh lime soda, ice tea and canned drinks. For hot beverages, they have several drinks to choose from ranging from their special tibetian tea- bhoe ja to the more usual black coffee, herbal tea, etc..
Coffee House offers a blend of Tibetian and the traditional café culture. Breakfast becomes a delight with a sumptuous combo of cheese omlette, porridge and bread along with tea. Also, one could go for their speciality-tibetan bread. The staff is very kind and friendly. When you enter the café, they hand over a piece of paper and pen to write your order on which they come and collect from your table. Every member of the staff serves you with a big smile. The ambience is extremely warm and welcoming. You can sit there for as long as you want, nobody will disturb you. Good music plays in the background. The volume is just perfect, neither very loud nor very low. The walls are painted a subtle yellow and are adorned with beautiful posters. This is the perfect place to run away from the humdrum daily city life and just relax.